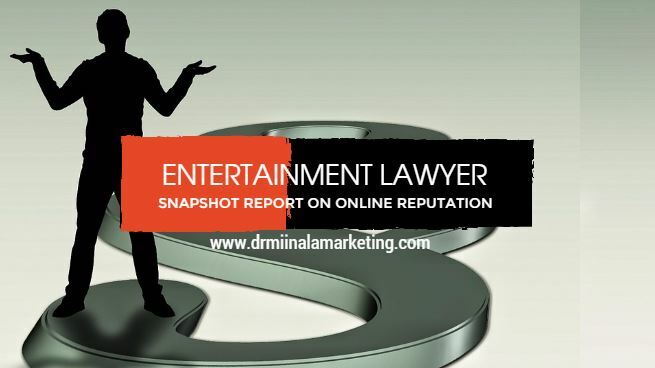 Dr. Miinala Marketing has announced the availability of a new entertainment lawyer snapshot report. The free report is designed to help entertainment lawyers realize how their online presence is currently being seen. The report will serve as the foundation from which the company can help the lawyers enhance their online presence with the result of generating more income by driving organic traffic to their website and generally gaining more customers. A spokesperson for the company says, "We design these reports to show you how relevant you are online. If you are not getting the traffic and customers that you want, our report can help to determine where your website may be lacking and help us to determine what needs to be done to see that you enjoy more online success." The company says that the reports provide information to website owners about their business and how customers may see them when they view them online. The company states that online reputation is vital to gaining more website visitors and ultimately, more customers. The report shows the reputation and online popularity of businesses, helping the company to determine where work may be needed to help that business grow a better online reputation. Part of the strategy to improve online reputation includes social media and other websites, such as a LinkedIn business page. "People search for local products and services online," says the company spokesperson. "If you have a business, even an offline business, you have to be accessible to an online audience. Otherwise, you are missing out on a lot of potential business." Dr. Miinala Marketing assists lawyers and business owners in learning more about if and how they are being viewed online. The report includes information that helps them to determine if potential customers or clients are finding them online when they search for local products and services and if not, they state that they can help those businesses to better market themselves to an online audience which ultimately means more customers and higher revenue. From establishing a Twitter business account and Facebook business page to using review sites to improve the business' online reputation, Dr. Miinala Marketing states that they can help entertainment lawyers to better improve their overall reputation and gain new customers, no matter what city or region their business is located in. The company includes a staff of marketing experts and SEO specialists as well as graphic artists and others that help businesses to better reach customers in the digital age. More can be seen on the company's official website.